We’ve long admired their imperious and noble bearing, their sheer power and strength. They’ve been used as emblems and symbols of power by rulers such as Julius Caesar, Charlemagne, the Tsars of Russia and the Kaisers, and as many as 25 countries depict them on their coat of arms. The Bald Eagle is the national animal of the United States. Our own ancients, too, were in awe of them: the Golden Eagle was thought to be supreme (suparna) and is said to have inspired the sages of the Rig Veda. World over, we really seem to have been gob-smacked by these magnificent birds — the eagles. There are around 60 species in the world. For India, I counted out 16, ranging from the majestic golden eagle to the compact and rare Nicobar Crested serpent eagle. I’ve been lucky enough to meet a few, fairly close-up: on an overcast morning in Bharatpur years ago, we came across a Tawny Eagle perched on a dead tree. We snuck closer and closer until we were at the base of the tree, clicking pictures and then feeling rather foolish, just gaping at it. Eventually, it probably got a bit fed up and flew off. Also in Bharatpur, we once saw a Crested serpent eagle, beautifully lit by the early morning sun. This is one species I’ve met in Delhi, too. For several years, a Crested Serpent Eagle would camp for a few days in October in the Nicholson Cemetery next door before disappearing. And then, we met one in the canopy of trees at Teen Murti House a few years ago. 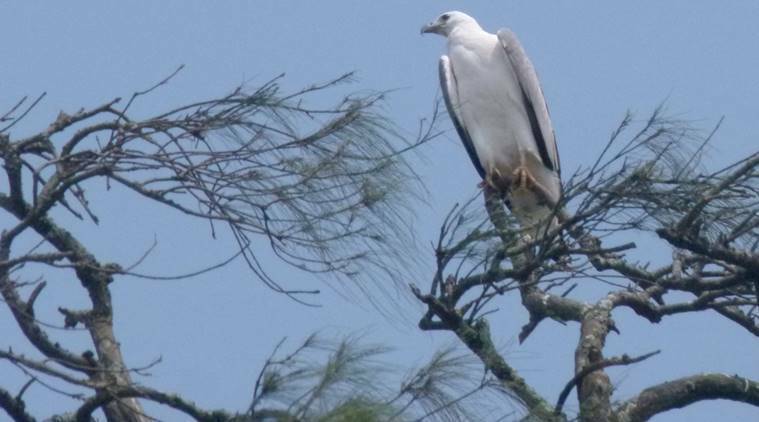 There have, of course, been several other brief encounters, including watching a beautiful white and silver-grey white-bellied sea-eagle keeping a lookout from a tree-top on a Goa beach. It can be difficult to identify eagles: most are umber brown with varied white markings — spots or flecks on their wings, under their wings and tail. Worse, many only attain their fully adult plumage when they’re four or five years old and until this time, can drive you nuts as they go through various plumage changes. Some are resident and some winter visitors. They are a pretty conservative clan: they are monogamous and often use the same nest year after year, (it’s called an eyrie) often adding to, and embellishing it, till it attains colossal proportions. Their family life can be vexing. Usually, two eggs are laid several days apart and the chick that hatches first (usually a daughter) will kill her younger sibling in order to get all the attention and food from her parents. Mom and dad are fine with this. What kind of makes up for this is the touching tenderness with which the female feeds her young: tearing up strips of meat and gently offering them to her fledgling. Usually, she is larger than her mate. While Golden eagles are hunters, swooping down on foxes, hares, sheep and gazelle and other small animals, the sea-eagles pluck snakes, eel and fish out of the water. The Mongolians have, for long, trained Golden Eagles to hunt for them. The Golden Eagle is the fastest flier of all eagles and I was amazed to read that it clocks 320 kmph, a speed I thought was only achieved by the Peregrine falcon. But, then, for this bird, the top speed mentioned was an astonishing 389 kmph. And, yes, the Crested serpent eagle does take snakes. But, alas, there are others which have sort of sullied the noble reputation of the clan. Several eagles — the Tawny eagle (a resident) is a prime example of this — subsist on carrion and offal, and small animals they can filch from other raptors. The Tawny likes to hang around rubbish dumps and slaughterhouses. The Imperial eagle, a migrant, is an out-and-out bandit — robbing other raptors of their prey. It also goes in for carrion, rodents, small birds and reptiles. By and large, eagles are equipped for what they do: Their wings are large (the wing-span can be six feet) and broad, enabling them to soar and circle with nary a wing-beat for hours at a time; their fish-hook bills are sharp and powerful, perfect for tearing flesh and their grappling-iron talons can probably shatter and crush every bone in your wrist if the bird clamps them on it. Their eyes have five times the number of light-sensitive cells as ours and they can winkle out prey — say a rabbit well hidden in grass — from a long distance. They have a deep brow which protects them from the sun’s glare and also gives them that fierce glowering look — a hallmark of their clan. For all their majesty and splendour, eagles, alas, are not blessed with the most impressive of voices. Most emit high-pitched screams: a Pallas’s fishing eagle I saw in Bharatpur again, threw back its head and called — sounding exactly like a smacked puppy yelping! But they do show their true splendour — and aerial talents — while courting or in combat. The spectacular dogfights take place high above and suddenly the combatants tangle claws and somersault together down, down, down. Usually, they free themselves just before hitting the ground, leaving onlookers breathless. But then this is what these birds are all about.